The latest Old Farmer's Almanac is out with its usual boast of being 80% correct. But are they really that good? From what I have seen in past years their accuracy is much, much worse than advertised! How about this year? This study found that the national regional forecast for Winter had both the temperature and precipitation correct only about 13% of the time and Summer forecast was correct just 6% of the time. The California forecasts for temperature were right only 13% of the time and the precipitation was correct 27% of the time. 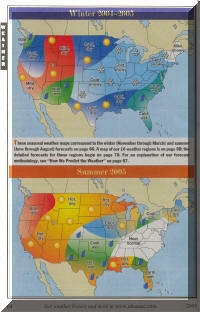 Last November's 2005 edition of the Old Farmer's Almanac (Yankee Publishing, Dublin NH, 2004) was examined. There are seasonal weather graphics for winter and summer (Fig. 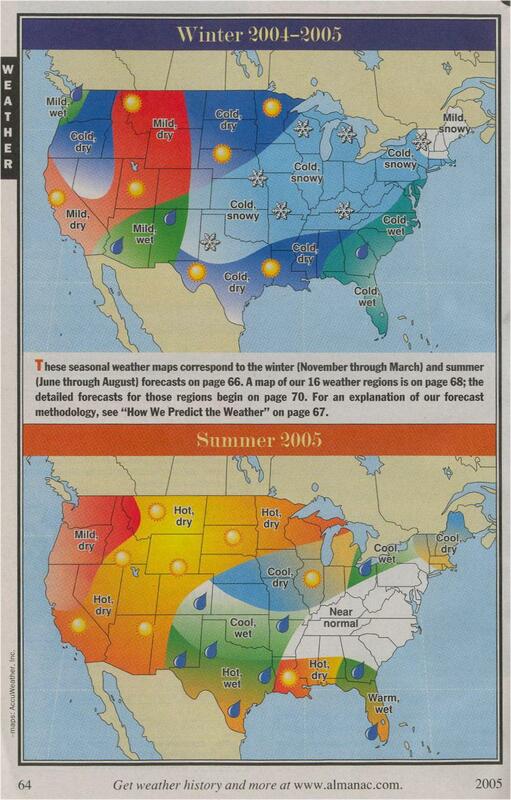 1) from the 2005 Old Farmer's Almanac (OFA). The weather forecast section of the is also divided into 16 regions. Region 16 encompasses the southern three-fourths of California and is broken down by month with "forecasts" of how the temperature and precipitation compare to normal. Figures 2 is the actual forecast for Region 16 from the Almanac. The OFA seasonal forecasts for the nation were evaluated for the Winter (November through March) and Summer (June through August) using the temperature and rainfall departures from normal by month for the United States Climate Divisions (NOAA-CIRES Climate Diagnostics Center US Climate Divisions Plotting Page). To evaluate the Region 16 forecasts each monthly forecast was compared to the actual monthly temperature and precipitation anomalies by climate division. Data for climate divisions was chosen because of the large number of sites that are used in determining the division average, thus eliminating the bias of a single station. Temperatures were evaluated for all 12 months while precipitation was only looked at for the the California "wet" season of November through April. The "graded" seasonal forecasts below are a subjective verification of the Old Farmer's Almanac seasonal forecasts. 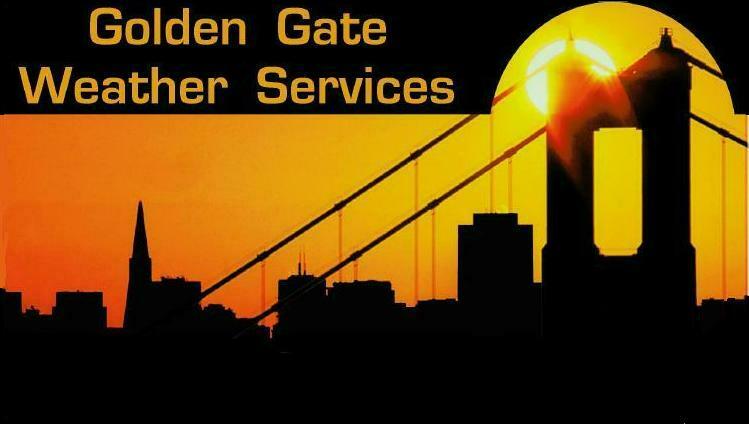 The basic methodology was to deduct a grade for each part portion of a regional forecast that was incorrect and two grades if the sign was also incorrect. If both the temperature and precipitation forecast were correct and had the appropriate magnitude then the region would get an "A" grade". Overall the seasonal forecasts averaged a grade of about "C", meaning at least the precipitation or temperature was wrong. Only 2 of the 16 (13%) Winter forecasts got both the temperature and precipitation right and just 1 of the 18 (6%) Summer forecasts verified. The subjective analyses in the table below compares the monthly forecasts for Region 16 from the 2005 OFA with the actual observed monthly climate division anomalies of temperature and precipitation. Because of the scarcity of rainfall in the California in the summer months, precipitation for the months May through October was not evaluated. Furthermore, if either the forecasts or the observed data were geographically split then separate analyses were done for each geographic area. The observed data has been color-coded to reflect each of three categories. Forecasts which were judged correct are blue. Those which had the right sign (i.e., above normal observed when above was forecast or below normal observed when below was forecast) but where the quantity was incorrect are coded in yellow. Forecasts that had a large range that was partially corrected are colored orange. And forecasts which had the wrong sign are coded red. For California, Region 16, a total of 11 precipitation forecasts and 23 temperature forecasts were evaluated. Of the precipitation cases 27% were correct, 36% were quantitatively wrong and the remaining 36% had the incorrect sign. The temperatures for region 16 were only correct 13% of the time, had the wrong sign in 22% of the cases, were quantitatively wrong 39% of the time and were partially correct 26% of the time. Overall the California forecasts were correct only 23% of the time.